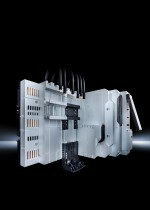 RITTAL says human-machine interfaces play a key role when choosing manufacturing equipment, potential purchasers not only consider the quality of the machine and the products manufactured, but user-friendliness and a robust, well-designed operator control system, often influence decision-making just as much. Engineering specialist Laempe & Mössner produce several lines of core shooters and equips its core shooting machines with Rittal’s support arm and housing systems. RITTAL says its new System Catalogue 35 showcases the company’s portfolio of products for the IT and manufacturing industries, which are designed to address the needs of design engineers, switchgear manufacturers and data centre operators. RITTAL reports it will be showcasing some of its leading enclosure technologies at Drives and Controls 2016. Rittal says visitors to its stand D230 will be able to view its innovative modular enclosures, power distribution, and climate control systems, commonly specified as the number 1 choice for protecting critical equipment and says of particular note will be the presence of the new, award- winning Blue e+ climate control system which was launched last year to great acclaim thanks to its outstanding energy savings and flexibility.